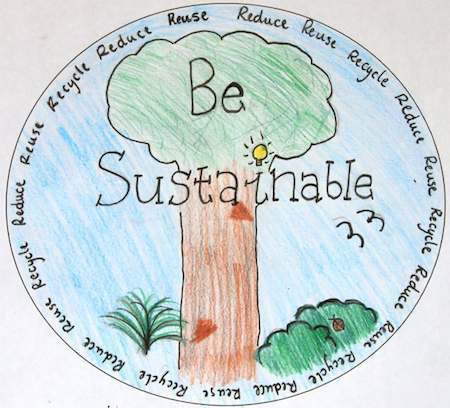 These are some of the sentiments that students at Chatham Primary School are learning as they follow a sustainable schools program. While Annabelle and Bec have focussed on global issues in their posters, the schoolʼs aim is to make positive changes within the school and become a role model for the local community and other schools. Chatham Primary joined the ResourceSmart Schools program in 2008, however it was the children who first came up with the ideas. The grade five students all participated in workshops where they were asked what changes they would make at school with the aim of improving the school environment and lightening its ecological footprint. The kids showed great creativity and practicality in their ideas and a genuine understanding and knowledge of sustainability concepts. If these ideas are indicative of those of most children, then the future is in good hands. Some of their suggestions were to install dual flush toilets; to install water tanks to water the grounds and to flush toilets; to create habitats which encourage native animals; to introduce chooks and install a chook shed; to install solar panels; to install energy saving globes and automatic sensors; and to implement ʻDress Up or Down Daysʼ to rely less on heating and cooling. The workshops created a great sense of ownership and empowerment amongst the children. They were being asked, they were being listened to, and three years on, many of their ideas have been implemented. Chatham Primary School now has six water tanks, two of which are used to flush the student toilets. Overflow from drinking fountains is collected in buckets and used by the grade threes to water the garden. A newly-grassed oval is watered from an underground tank that collects all storm water runoff. There are twelve solar panels on the roof – not enough to produce much in the way of energy savings, but the children learn why they are there and use the data from the smart meter in maths problems. Each class appoints ʻenergy monitorsʼ who are responsible for turning off lights, computers and heaters when the room is not in use. 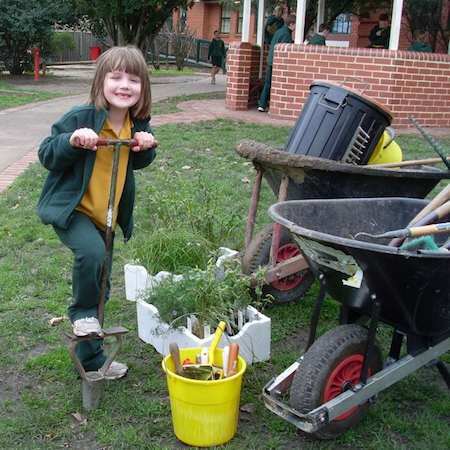 Three years’ worth of indigenous plantings have turned the school grounds into a showcase for local plants. The students helped plant tubestock to create an ʻIndigenous Gardenʼ and a ʻHabitat Gardenʼ both of which are lush and healthy. And the children have their chooks. Six pampered barnevelder chooks live in a ʻchook palaceʼ, which sits next to a number of productive vegie gardens. The children feed them and collect their eggs, and play with them like they are cats. There are so many benefits to the sustainable school journey: for the school, the children, and the families that the children then influence. Itʼs only sensible for schools to be sustainable. If they use less energy on heating and cooling, they get lower power bills. If they create less waste, the rubbish removal bills are less. If they use less water, the water bills are reduced. The result? More money to spend elsewhere. Combine that with the reduced carbon footprint and itʼs all good. Suzette Hosken is Coordinator of the Sustainability and Environment Committee, Chatham Primary School. Images © Suzette Hosken, all rights reserved.